Make 2019 the year you seize the wholesale eCommerce opportunity. Wholesale is a £30bn industry in the UK, with around 15% of this (£4.6bn) currently being ordered online. Most brand owners see the opportunity but until now they’ve lacked the tools and insight to drive sales and profit via online wholesalers such as Booker, Brakes, Bidfood, Bestway and CostCo. We’re proud to introduce you to e.fundamentals wholesale - the first eCommerce insight service that’s dedicated to helping brands win in the wholesale channel. Download the e.f wholesale one-pager & be entered in our monthly prize draw. The wholesale analytics platform is made up of three levels of insights. Each level identifies opportunities to improve product performance within wholesale and foodservice eCommerce websites. The insights are filtered and presented via a simple and intuitive dashboard to ensure you get the content right, price and promote effectively and optimise ranging and visibility. 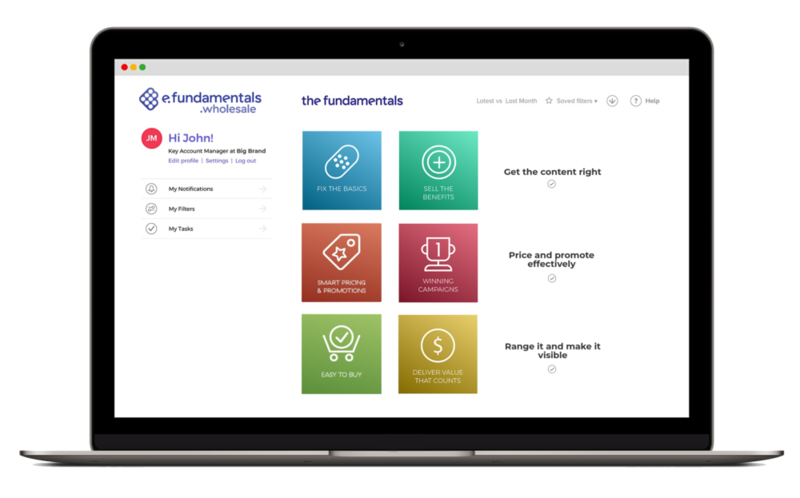 The e.fundamentals wholesale dashboard groups insights within the 6 fundamentals framework in a clear and intuitive way, using the language that sales and marketing teams already understand. Implement consistent standards across all your wholesalers by correcting the product page basics; name, image, description, POR, WSP, RRP & case quantity. Ensure your product descriptions are targeting business owners & food service buyers who shop wholesale, rather than retail shoppers. Ensure this product information is rich with relevant and useful content to help wholesalers convert more online sales from convenience, food service and business buyers. Track and measure compliance of your key benefits across your wholesaler’s websites. Secure a wide category view on your price and promotion activities to avoid potential down-trade opportunities..
Get price alerts to keep up to date on daily price movements in your category and stay ahead of competition. Export price reports to share internally, gain insight into price changes over time and assess and how this could be affecting your sales. Quickly access campaign insights through a calendar view. Understand competitor activity in the market and develop rapid responses. Understand your entire category’s promotional activity over time. Cross-analyse your campaign insights with your sales data to assess effectiveness of campaigns. Review your share of wholesale search and search rankings. Build supporting strategies to grow your share within key search terms. Help wholesale and foodservice buyers to quickly find your products and understand the benefits. Maintain high visibility of your brand and all your products throughout the online purchase cycle. Learn at pace what product mixes are present in wholesalers. Close sales gaps by using detailed reports to illustrate where ranging opportunities lie. Keep on top of your range by ensuring your products are live on site through wholesale insights built specifically for Sales & Marketers. Get in touch to find out how big of an opportunity wholesale can be for you. The UK wholesale market is worth £30bn of which £4.6bn is ordered online*. Our thriving convenience sector is pushing this number north at a tremendous pace. As the next, fastest emerging opportunity, we’ve seen brands excited by what they can do with wholesale and how it will accelerate their growth and online sales. Brands that jump first into this emerging market will have a significant advantage over companies that follow. We take a deep dive into the wholesale sector and unpack where it currently is and where it’s heading. e.fundamentals retail provides eCommerce analytics to brand owners looking to drive their category sales and profit with online retailers.